It’s still 100 degrees where I live but as soon as school starts my thoughts turn to Fall. There really isn’t much of a weather change in the desert, but I remember my childhood in Indiana and that’s when Fall became my favorite season. Fall in Indiana is amazing! I can still smell the crisp air and feel the leaves crunching beneath my feet. We lived in a subdivision but our backyard backed up against a farm and I loved harvest time, mostly because I knew Halloween was fast approaching, but also because it was fun to play in the freshly plowed field. 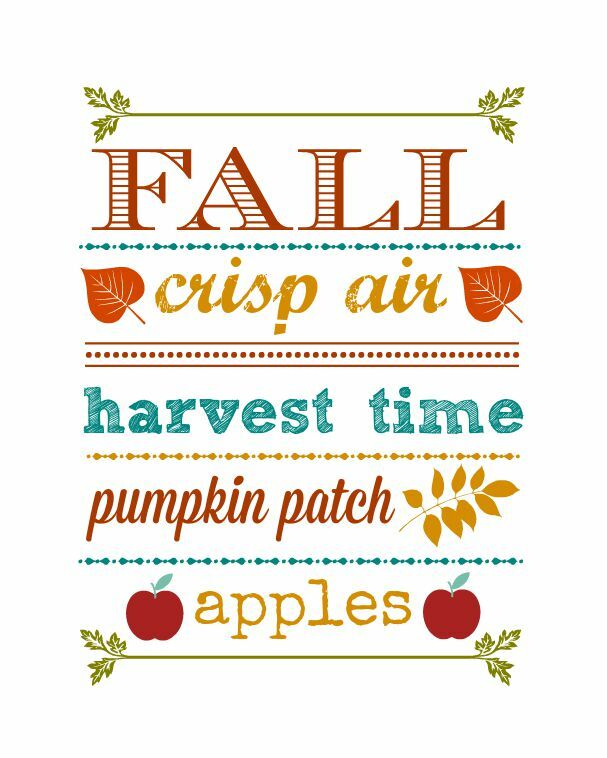 I made this Fall Printable reminiscent of Fall in Indiana and of my childhood playing in the fallen leaves and picking apples. Who else remembers raking leaves into piles just to jump into them or burying yourself in leaves and jumping out? I would help my mom make apple butter and fruit leather with the apples we picked. I wish I still remembered how to make apple butter. It made the house smell amazing! Okay, that’s now on my list to make this Fall. I want my house to smell like delicious ripe apples. Maybe I’ll do a week of apple recipes. I love non-traditional Fall colors so I added a little blue to the printable. I like the deep rich colors of Fall but I also like to add a little contrast and change it up a bit. I’ve been holding off decorating but I don’t think I’m going to be able to wait much longer. The white pumpkins are trying to bust out of their storage bin! Can I tell you a secret? I love opening the holiday bins. I always forget what I had from the year before so it’s a nice surprise and like shopping at home for free. Sometimes it’s good to have a bad memory. If you would like to use the printable for yourself, just click the link below the print. Printables are for personal use ONLY and are available to subscribers of Organize & Decorate Everything. SUBSCRIBE NOW to get full access to all printables. I would recommend getting the posts delivered by email. Okay, I really want to know your favorite Fall memory. Leave it in the comments below. I think this season hold the most memories for me! fellow Hoosier! Agree Indiana has the best falls! Where did you live in IN?! I live in Indiana and have lived here or just over the line in Michigan my entire life. My favorite part about fall is the temps. Not too hot and not too cold. A light weight jacket or sweater and we are good to go. And the color of the leaves, oh my. Most years the colors are just so gorgeous and I just want to take picture after picture but it really doesn’t capture the beauty. I love this printable! I have never printed one before so I am hoping you can offer me some advice. Do I just print on regular computer paper or should I look for some type of speciality paper? Thanks in advance! i fell in love with my husband in the fall, 26 years ago.